Authorities reported a possible rain-wrapped tornado south of the Salina Airport at about 6:30 p.m. this evening. The National Weather Service confirmed that report. High winds caused tree damage throughout town but some of the worst damage occurred southwest of the city limits, where the tornado was said to have passed. 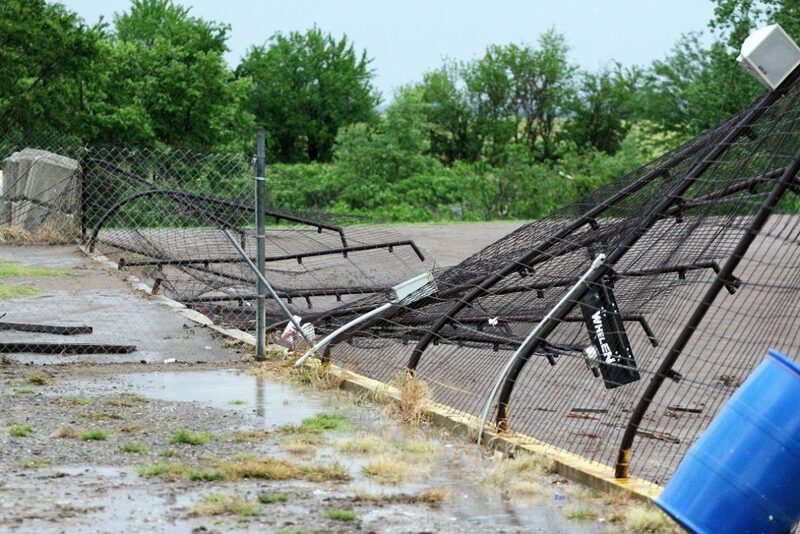 The Salina Speedway, located at 2841 S Burma Rd, reported heavy damage to buildings and track equipment. The roof of the press box had been partially blown off and the catch fence on the north side of the track was pushed over. Power line poles had also been broken off down Burma. Saline County Sheriff’s Lt. Hayes arrived on scene. He said that he had also been to a residence in the area that had a tree fall through the roof. Damage was reported to a couple homes on Lightville Road and South Crest Lane. Lt. Hayes said that no injuries were reported this evening and the displaced family had a place to stay for the night. Lt. Hayes said he had several deputies deployed south of Salina before the storm but they pulled back due to poor visibility. They have since returned to the area to check on and assist residents. According to Westar Energy, more than 1,200 people lost power due to the storm.